Apple held their 2014 Q2 financial results call yesterday afternoon. During the call they announced iPad sales numbers which were down compared to the same quarter last year. The number of iPads sold in the second quarter was 16.3 million (down from 19.5 million in Q2 of 2013). — The iPad is the fastest growing product in Apple’s history, with over 210 million sold to date. Over the same timeframe since original release, its sales have doubled those of the iPhone. 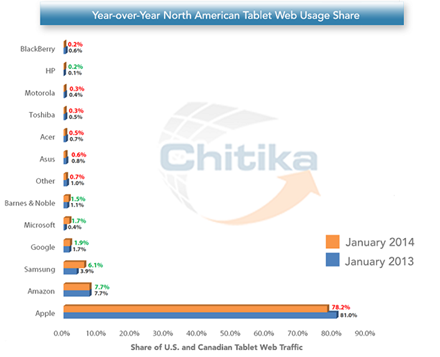 — iPad users in the US generate almost 4 times the traffic of Android tablets. 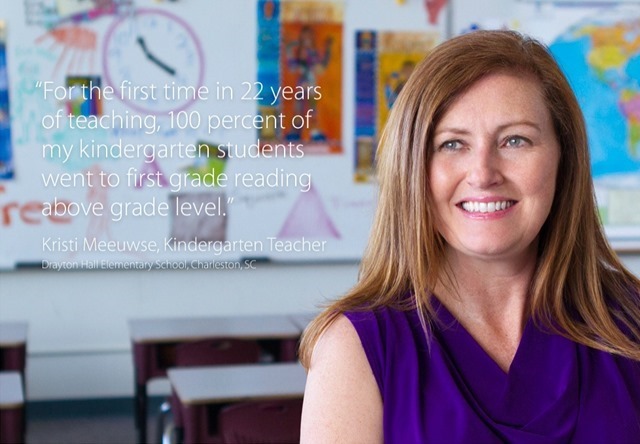 — iPad has over 95 percent share in the U.S. education market. 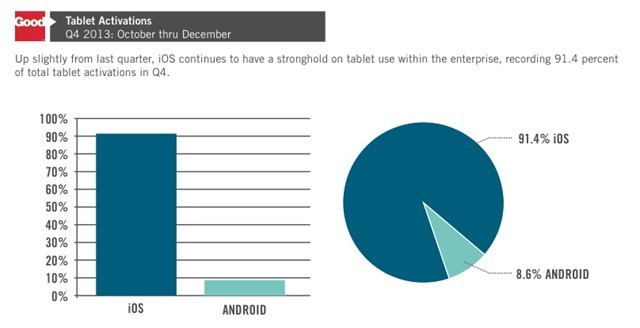 — 91 percent of tablet activations in enterprise are iPads. Not too shabby for a ‘disappointing’ quarter for the iPad. As you can see in the chart above, iPad sales in 2013 outnumber the total sales for the next 4 contenders combined. 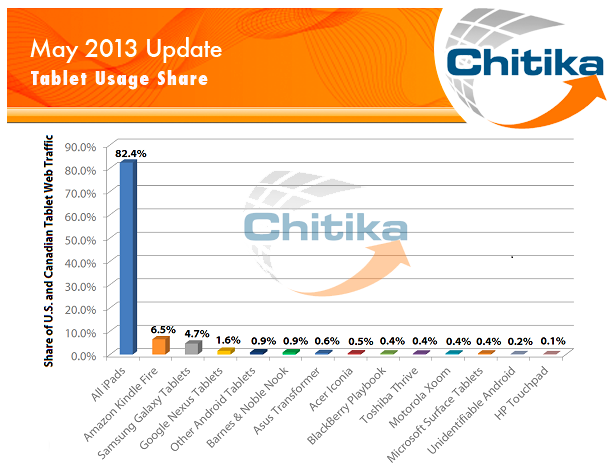 Android, as many expected, has grabbed the lead in market share, with around 62% – while ‘iOS’ is listed at 36%. It’s notable that a huge portion of the Android market share appears to be very low-end, no name (or White Box) tablets – a market that Apple wants no share of. — Samsung is listed as having gained the most in the tablet sales chart – which is especially interesting since Samsung doesn’t ever announce actual sales numbers. Also, according to Apple Insider, Gartner’s iPad sales numbers for iPad are around 3.5 million short of Apple’s officially reported figures. — Microsoft’s heavily promoted Surface line doesn’t even merit a line item in the sales chart. Worse still, the market share for Windows-based tablets is at just over 2% – compared to around 98% for Android and iOS combined. With the glut of new devices now in the hands of consumers – which tablet manufacturers are seeing their devices used more frequently by their new owners? And the answer is the same as it always has been – Apple. 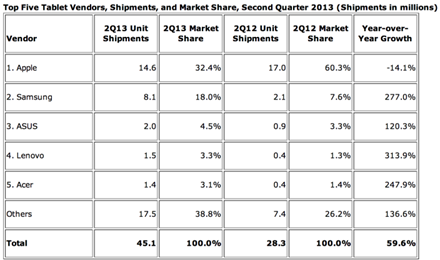 The iPad continues to have a larger share than all the other ‘leading’ tablets combined. Although the iPad dropped slightly in comparison to this time last year, it still weighs in with a little over 78% share. 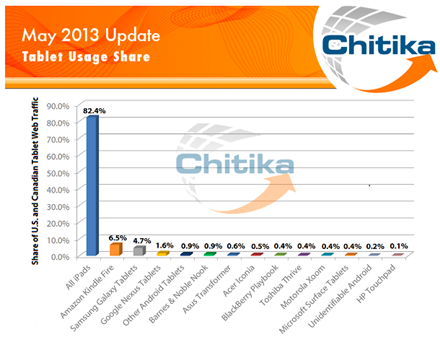 Amazon comes in a distant second place with 7.7%, so around one tenth the share of the iPad. Samsung is next with a little under 7%, and no other manufacturer even hits the 2% mark. Microsoft, despite their no-stop barrage of ‘real work’ themed ads bashing the iPad, is barely a blip on the chart at 1.7%. Apple revealed some impressive iPad numbers during their Q1 2014 financial call yesterday afternoon. 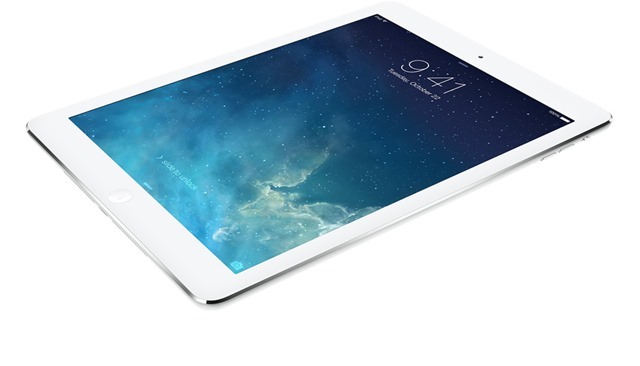 For the quarter that ended on December 28, 2013 the company set an all time record for iPads sold in a quarter. — 26 million iPads sold – up by 14% vs. the same quarter a year ago. This was achieved despite supply constraints on new iPad models during the quarter. — Surveys show a 97% satisfaction rate for the iPad. — iPad holds a 78% share in the US commercial tablet market. Not bad considering how the competition has heated up in the tablet arena over the last couple of years..
Apple announced its Q4 financial results yesterday afternoon. As always, they took some time to share the latest impressive iPad numbers during their earnings call. — 14.1M iPads sold in the quarter. Only a little up from 14 million in same quarter last year – but not too shabby considering no new iPads all year so far and the heavy anticipation of the new models announced last week. — 71 million iPads solid in Apple’s fiscal year of 2013. — An incredible 99% customer satisfaction rate. Because, as Microsoft would have us believe, that’s not real work when iPads are used for education. The latest report on tablet market share, released by IDC this week, has Apple still the leading single vendor – but with a much reduced lead. 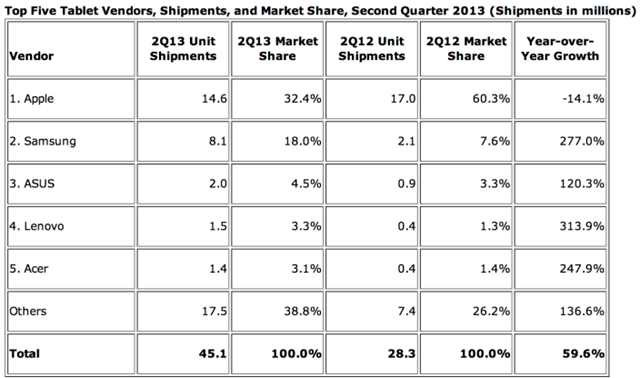 It lists the Apple / iPad market share at 32.4% for Q2 of 2013, down by almost half from the 60.3% in Q2 of 2012. The report shows Samsung’s tablet market share nearly tripling from the last year quarter – going from 7.6% to 18%. Asus, Lenovo, and Acer fill out the 3,4,5 slots in the report – but each of them have well below 5% share. 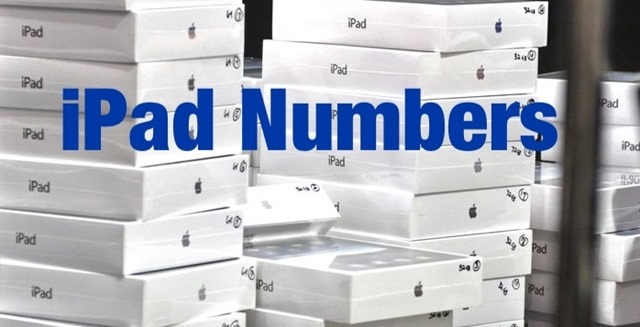 — IDC’s numbers are based on shipments of tablets, not sales – but the iPad number is the official Apple figure for iPads sold in the quarter, while Samsung and others do not even announce their sales numbers. — Notably absent and relegated to the ‘Others’ section are Amazon and Microsoft. That seems like a big loss of momentum for the Kindle Fire line, while the Surface line has never shown any impact since it launched. — If the Samsung figures are anything like accurate it doesn’t seem like a huge shock, as they’ve now got quite a good lineup of tablets in the 7,8, and 10 inch range. — The same goes for the dropoff in Apple share, with no new iPad release thus far this year. 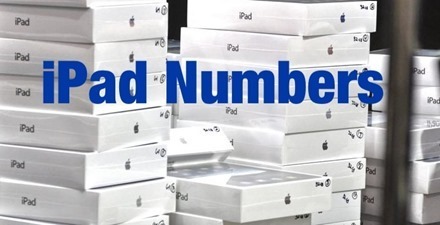 Apple announced some interesting iPad numbers today during their FY 13 third quarter results conference call. — 14.6 million iPads sold in Q3, down from the 17 million sold in last year’s quarter. The dropoff was attributed mainly to channel issues. 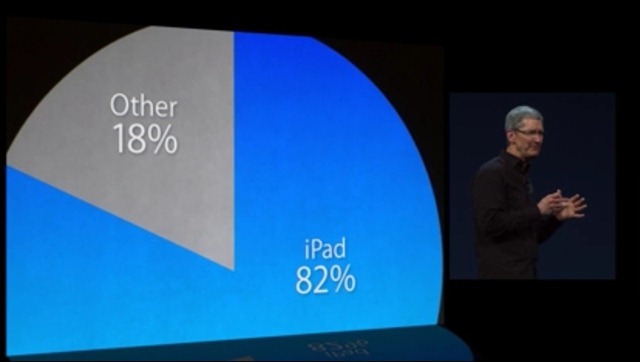 — On a brighter note, Tim Cook mentioned that year-to-date iPad sales are up an impressive 48%. — 1.1 million iPads were sold into educational institutions in the quarter – a new record. — Cook mentioned several blue-chip enterprises, including SAP and Nuvartis, that have deployed over 20,000 iPads each. — The iPad was Number 1 in JD Power’s tablet satisfaction survey for the second year in a row (and the only two years this survey has been run). — Latest figures show iPad still accounts for a massive 83% of tablet web usage share. Overall this seems like a pretty strong set of numbers for the iPad, especially considering there have been no full, new iPad releases yet this year. One thing you can always rely on at Apple events is that some crazy, large numbers will be thrown around. Today’s WWDC 2013 Keynote event didn’t waver from that tradition. Just in the first few minutes we heard that there are now 6 million registered Apple developers, 50 billion apps have been downloaded from the App Store, and that WWDC itself sold out in just 71 seconds this year. 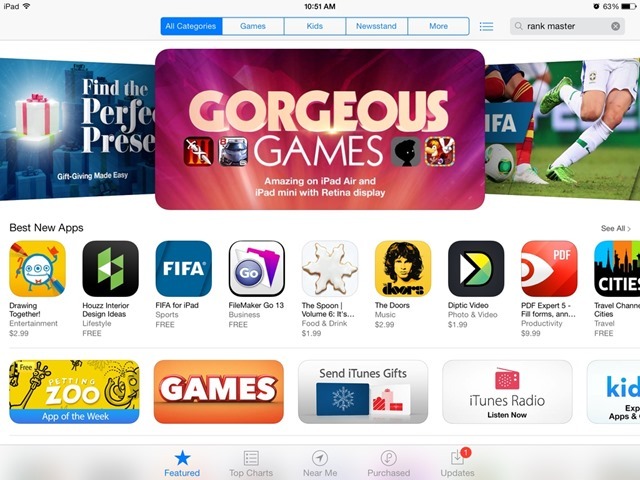 — There are now over 375,000 apps designed specifically for iPad. I’m surprised there was no comparison slide for this one, because it certainly seems like this is an area of huge competitive advantage for the iPad. It’s also worth noting that the 375k figure seems a little old. I’ve heard it mentioned before at least once, and the Appshopper.com today list the number of available iPad apps at over 421,000. — iPad now has an 82% share of tablet web usage. There are usually a few more iPad related numbers or comparisons offered at these events, but as I wrote earlier the iPad seemed almost an afterthought at today’s event.